Talking about pictures is often a funny thing. It’s easy to take a simple question and way overthink it. People sometimes ask me, how long did it take to get that shot? On the one hand, it’s pretty simple stuff. Something interesting happens and you push the damn button and hope for the best. The click of a shutter is over in less than the blink of an eye, a thousandth of a second. But everything that went into that shot? Weeks of travel, months of planning, possibly years of half-baked ideas and idle dreaming. Last summer I set out from my home in Seattle for the arctic circle. Suffice to say that it’s not a straight line sort of journey, and I wasn’t traveling light. Inflated with a perhaps undue confidence from my 2012 zodiac boat trip near Churchill, I decided to take my much larger (though still woefully undersized) 22-foot C-Dory boat out for a spin. It’s not quite the same as driving down to the local boat ramp and backing the trailer into Puget Sound. First I had to trailer the boat more than 2000 miles east across the Cascades and the Rocky Mountains to central Manitoba, the last eight hours of it on a grim and lonely gravel track through endless black-fly infested boreal forest. All to reach the end of the road 50 miles past the settlement of Gillam, and a steep bulldozed path leading to the Nelson River. I’d been told it was possible to navigate the river, but without charts I found myself navigating blind in the silty water. I only grounded out a few times, offloading 70 gallons of fuel and all my gear cases each time to lighten her enough to push off. Finally reaching Hudson Bay, I headed east, hoping to find the rapidly melting pack ice, running up to 80 miles from any shelter. When that didn’t work, I headed north, working my way slowly up the coast to Churchill and then the scattered small Native villages in Nunavut Territory. Hudson Bay is actually a vast inland sea, 800 miles long and as much as 600 miles wide. The surrounding landscape is vast and flat and unforgiving, and it offers precious few sheltered anchorages. A small boat moves at the mercy of the Bay’s frequent summer storms. I have never felt so alone in my life. After five weeks, I was ready to chalk it all up to a grand adventure. I’d seen a lot of new territory, managed to avoid destroying the boat or getting myself killed, and even managed to see a few polar bears. But it was hardly enough to justify the time, risk and expense. I’d longed to reach the pack ice, hoping to find polar bears and a more dramatic backdrop than the low rocky flats. The ice found me, got the boat in its grip and drove me onto the shore. I’ve heard that you’re on vacation up to the moment you’re sitting on the beach with your head in your hands praying just to go home. After that, you get to call it an adventure. It was a long and frightening day, but a turning tide opened up enough space in the ice for me to push off the beach and escape. And then it got good. The ice carried with it hundreds of walrus and dozens of hunting polar bears. My final week was filled with magic and drama. I’m particularly proud of this image, the winner of the 2014 Asferico Nature Photography Competition held by the Italian Association of Nature Photographers. 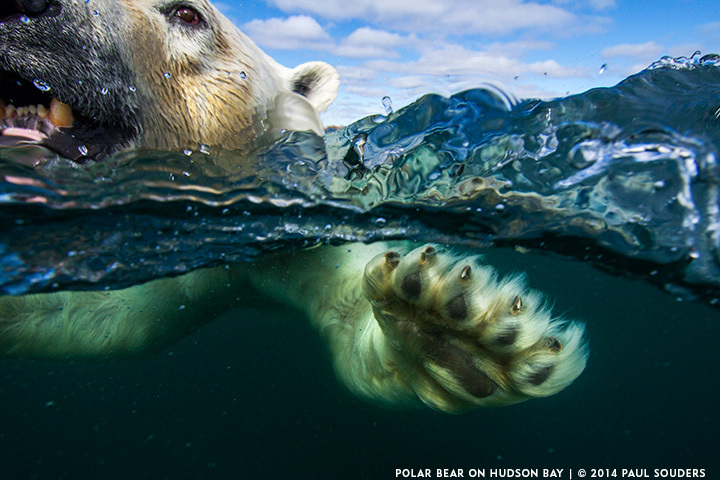 I saw a large male polar bear swimming near the arctic circle, and lowered my underwater camera near his head. I think we were both a little surprised, him when he saw his reflection in the acrylic dome, and me when he took a mighty swipe at it. The picture was over in an instant, I snapped the shutter by sheer instinct with no idea of the framing. But I hope that it captures some of the dangerous majesty of polar bears and the fierce wilderness that they call home. Image shot with a Canon 7D using an EF-S10-22mm f/3.5-4.5 USM, protected in an AquaTech Sport Housing. Exposure 1/800 second at f/9 using ISO 320. This entry was posted on Saturday, May 24th, 2014 at 2:27 pm. It is filed under News and tagged with Arctic, Awards, Canada, Contests, Photography, Polar Bears. You can follow any responses to this entry through the RSS 2.0 feed.